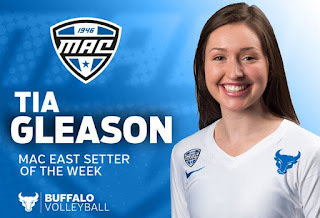 BUFFALO, N.Y. -- For the second straight week sophomore Tia Gleason has been named the Mid-American Conference East Division Setter of the Week, the conference office announced on Monday. Through four weeks, UB setters have now won this honor three of the four times. Gleason led the Bulls to a pair of wins at the American Volleyball Classic. She opened the weekend against American on Friday night and led the Bulls to the 3-0 road victory while dishing out 34 assists and adding eight digs. She had a career performance in the four-set win over Howard on Saturday as Gleason finished with 56 assists in the four sets, averaging 14.0 assists per set. Gleason also added 25 assists in UB's match against fifth-ranked Penn State. Through the first four weeks of the season, UB has earned six MAC player of the week honors beginning in week one as Andrea Mitrovic and Scout McLeran earned the awards. 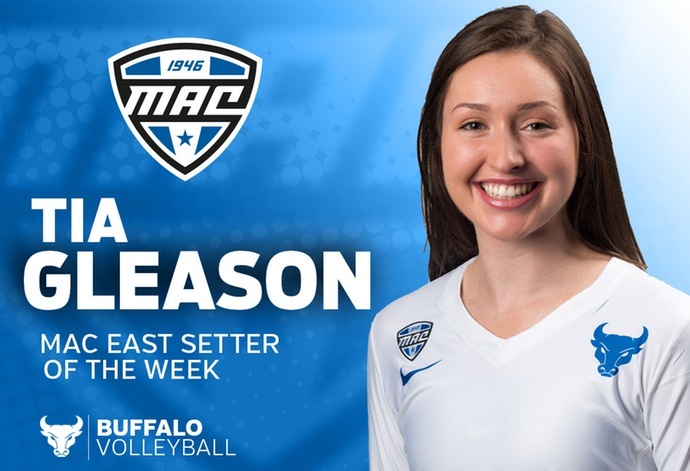 Last week, UB swept the players of the week as Gleason earned her first setter of the week honor, while Mitrovic and junior Kristina Nieves were also named players of the week. The Bulls return to Alumni Arena this weekend to open Mid-American Conference play. UB will face Bowling Green on Friday evening on ESPN3 and Miami on Saturday evening in a match that will stream on Youtube. Both matches are set to begin at 6pm and admission is free.